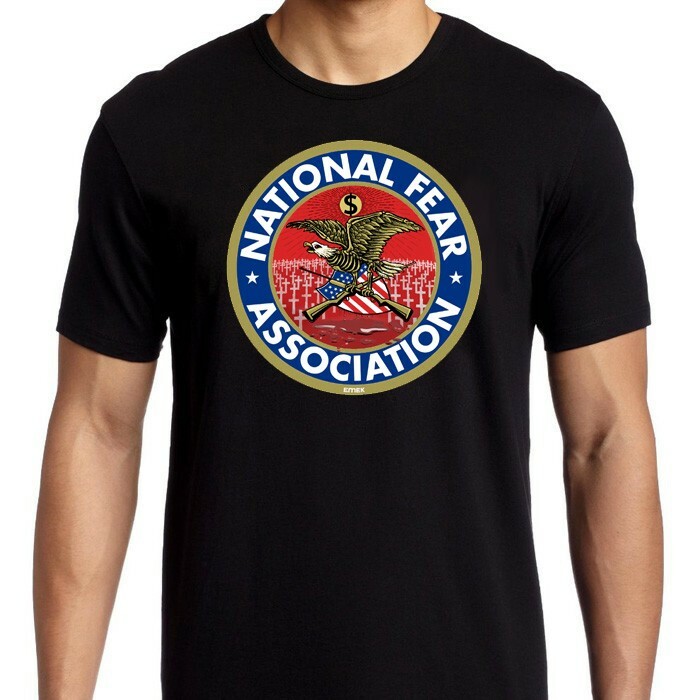 NATIONAL FEAR ASSOCIATION T-SHIRT BY EMEK!- NOW ON SALE! We here at Nakatomi have joined with artist extraordinaire EMEK to bring his amazing NFA design to t-shirts for a limited time! NOTE- First 50 orders will also get a 4×4 circle sticker of the NFA logo, provided by EMEK himself! AND- best of all, Nakatomi and EMEK will donate 100% of all profits to a non-profit that does the good work of standing up to the NRA and their quest for increased profits for gun manufacturers. The NRA has proven time and again what their real goal is- more guns, and going against the will of the American public regarding common-sense gun-legislation. And how do you sell more guns? By selling FEAR. The more afraid people are- the more guns they buy. Violent crime rates in America are falling to levels not seen in decades – Americans are safer now than at just about any point in the last 20 years- but that goes against their narrative. So in this political season, take a stand for sanity and help us make a BIG donation, and rock this sweet t-shirt! BIG thanks to EMEK for working with us on this project! Nakatomi will take pre-orders for this shirt from now until Friday night at MIDNIGHT Central time, and printing should begin the following week! This 100% ringspun cotton t-shirt will feature metallic gold ink! Note- if you’d prefer this as a sticker, EMEK is selling sticker packs produced by the fine folks at Sticker Robot HERE in his webstore. ← NAKATOMI at FLATSTOCK SXSW- Starts Tomorrow!